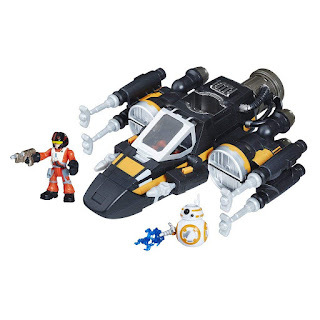 HURRY over to get this Star Wars Galactic Heroes Poe's Boosted X-Wing Fighter for ONLY $14.69 (Retail $26.99)! Blast off into a world of adventure with the Star Wars Galactic Heroes figures and vehicles! These fun figures and vehicles allow kids to imagine bringing the action-packed battles between the Resistance and the First Order. Sized right for young Jedi, the Poe Dameron's Boosted X-Wing Fighter vehicle lets kids imagine battling against the First Order!